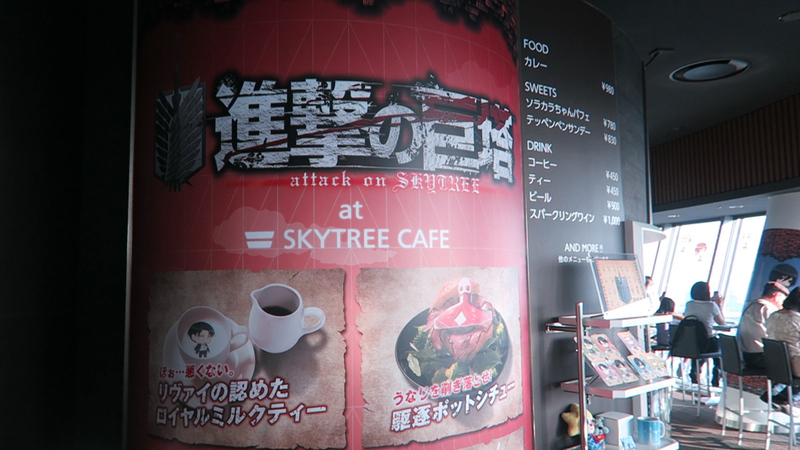 Attack On Titan Event & Cafe In Tokyo Skytree! 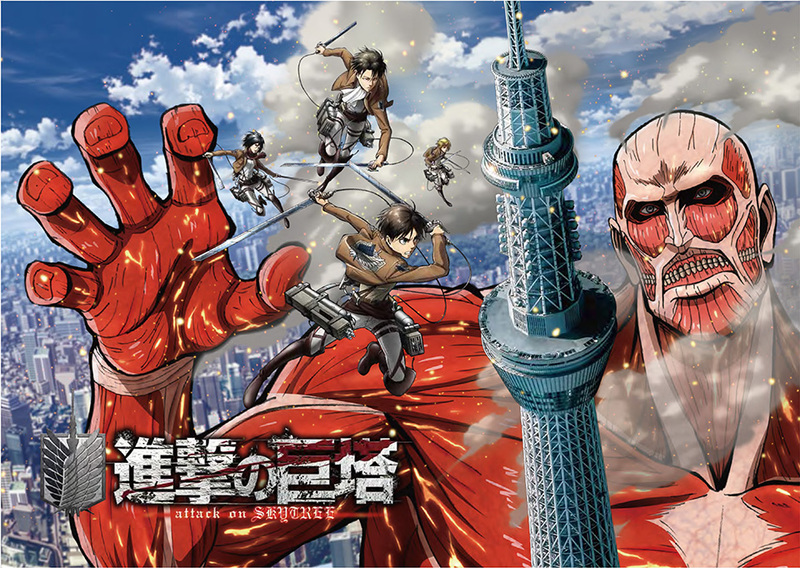 Attack on Titan (Shingeki no Kyojin) is an ultra popular anime show in both Japan and within an international audience. This is one of those anime shows that even the friends of yours who aren't necessarily anime fans would have probably heard of; the series has exploded to that amount of popularity. The hype for the series was further resurfaced with the release of the second season of the acclaimed anime adaptation which was released early April of 2017. But Japan - being Japan and all - loves to take something that has crazy amounts of hype and praise, and take it to rather extreme and creative proportions. And they certainly didn't miss it for this hype! The Attack on Titan event uses the term "event" quite loosely. It's more like an interactive museum situated 350m up the top of Tokyo Skytree, Japan's single tallest building structure. If you want to get a view of Tokyo from a height only otherwise reachable by plane, then this is the place to go. But we had a different agenda other than the skyline view; to interact with some titans. 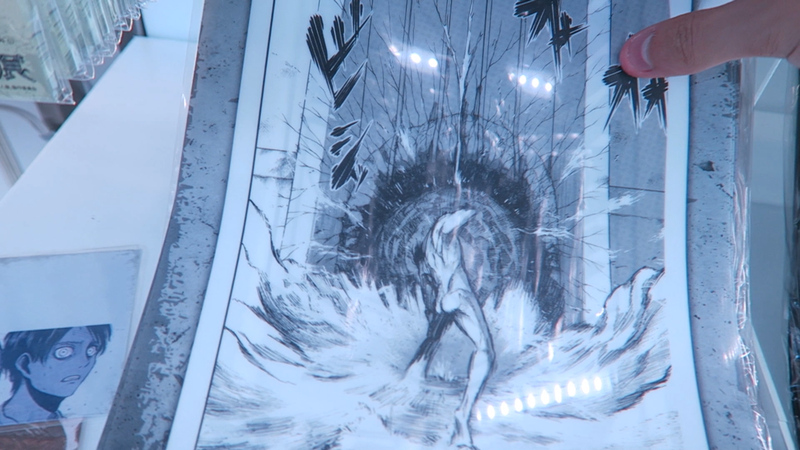 The first thing we came into contact with per exiting the main elevator to the 350m mark was a giant structure of the colossal Titan, made to look like it was bursting through the wall of the tower looking inside. It was certainly an impact-full start to the whole experience! 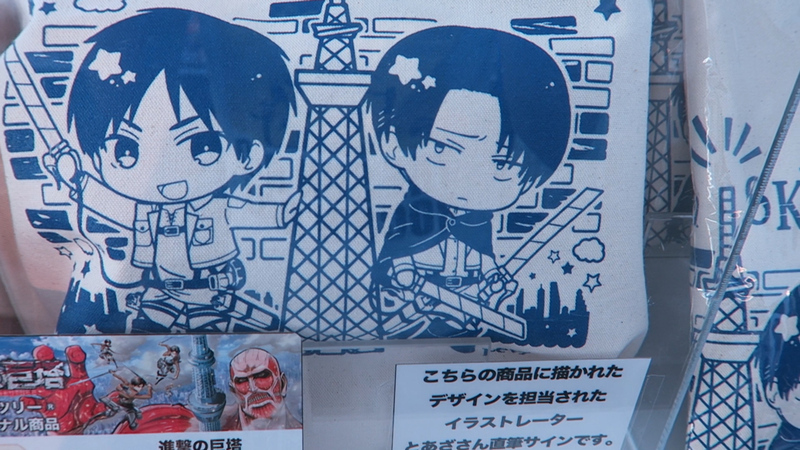 It's definitely a great place to take photos and show off to your friends and fellow Attack on Titan fans! 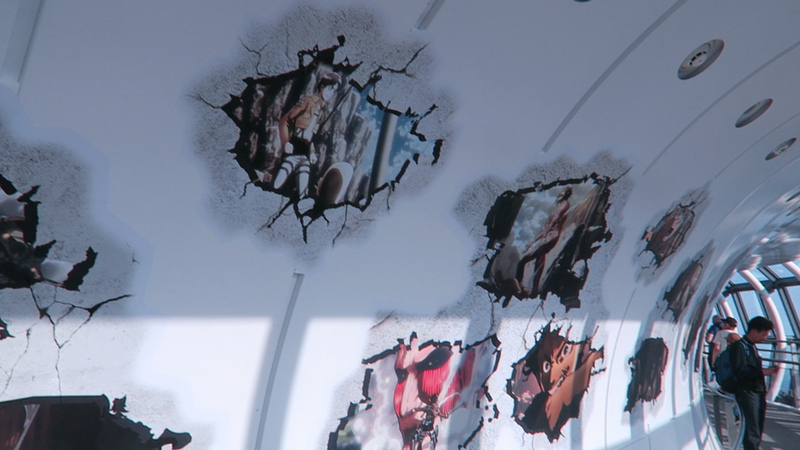 Scenes from the anime engraved into the walls. 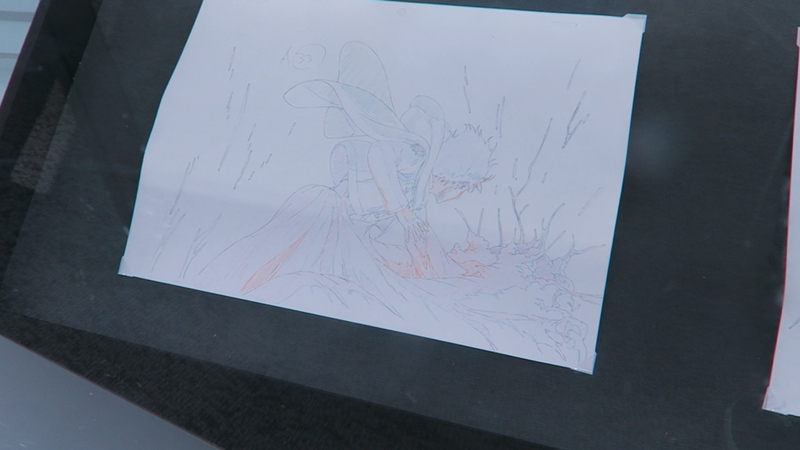 I really liked how they stylized everything! 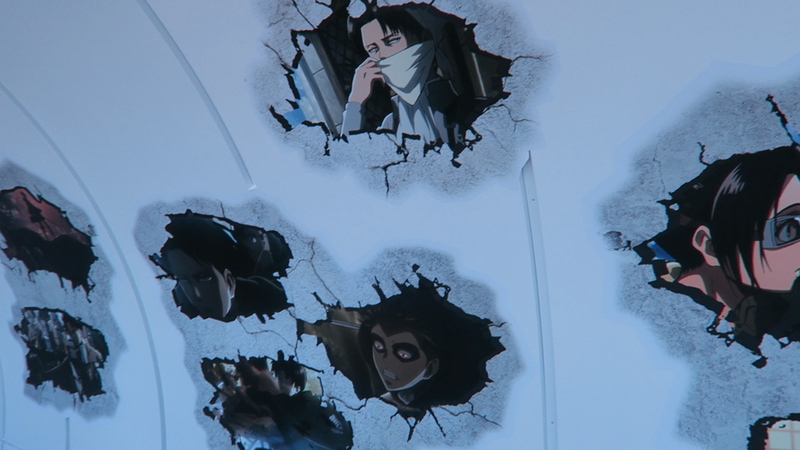 The rest of the exhibit was a simple slideshow of screenshots from the anime sprawled throughout the walls of the building, with a little mini-game for the younger attendees in which they had to find hidden stickers of mini-titans scattered around the entire tower to receive a special Attack on Titan themed prize at the end of the exhibit. As much as I wanted to take part in this, I figured it would've been a bit strange to see a full-grown 22 year old man looking for stickers in every nook and cranny of Tokyo Tower, so I decided to skip out on this time time. (Although if you're totally into that sort of thing, regardless of age, then go all out and have some fun!) There were also some other very cool additions to the exhibit, including some life-sized statues of some of the characters, official line-art drawings most likely used for promotional purposes like posters and merchandise and some raw animation cells that were used in the anime (which is - coming from an anime nerd like myself - was definitely the coolest thing to see during this whole exhibit, but I fear I might be alone on that point). One thing that is always a tradition with any popular franchise is the merchandise that is sold alongside it. 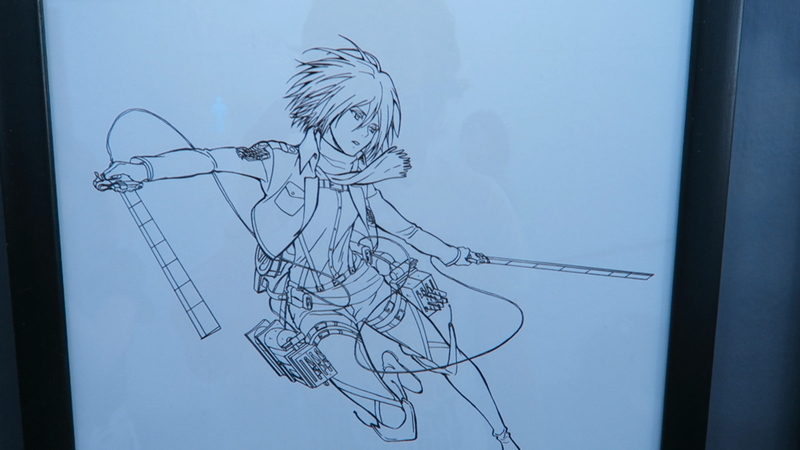 And Attack on Titan was certainly no exception to that rule! 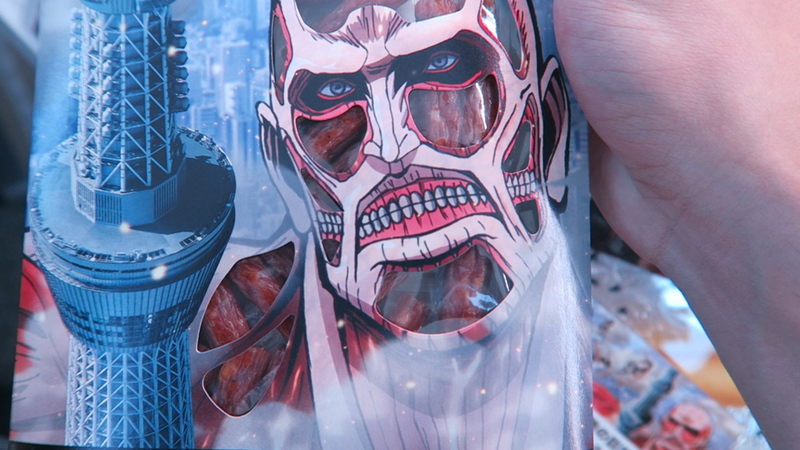 Everything from hand-towels, plastic sleeves, notebooks and beef jerky was being sold; all with the familiar Attack on Titan name slapped all over it. 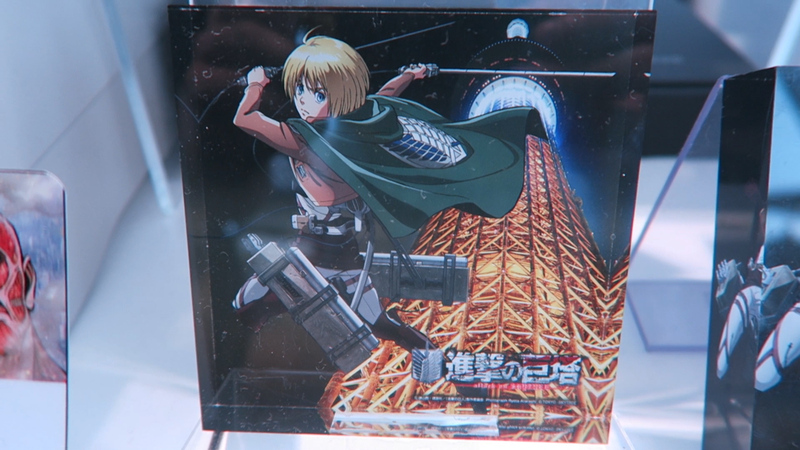 They even had some exclusive Attack on Titan x Tokyo Skytree smartphone holders which were pretty cool (but were a little too expensive for my tastes). 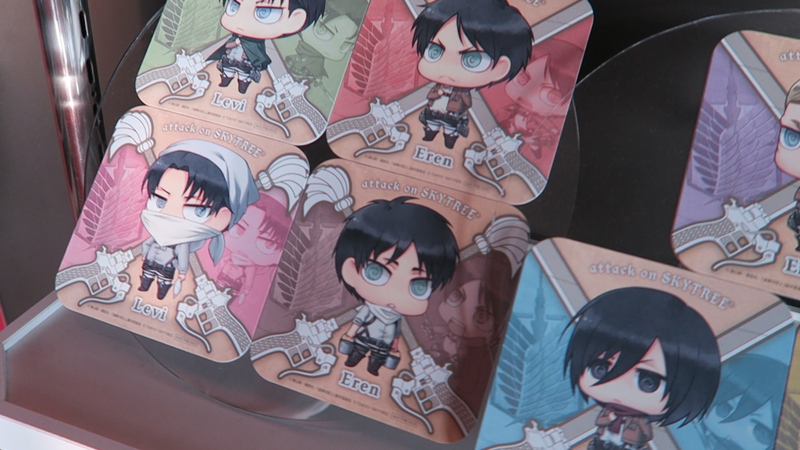 I personally didn't buy anything but if I were a colossal Attack on Titan fan (see what I did there?) then I definitely would have gone nuts in that very exclusive and cool store! Here are just some of things I saw! 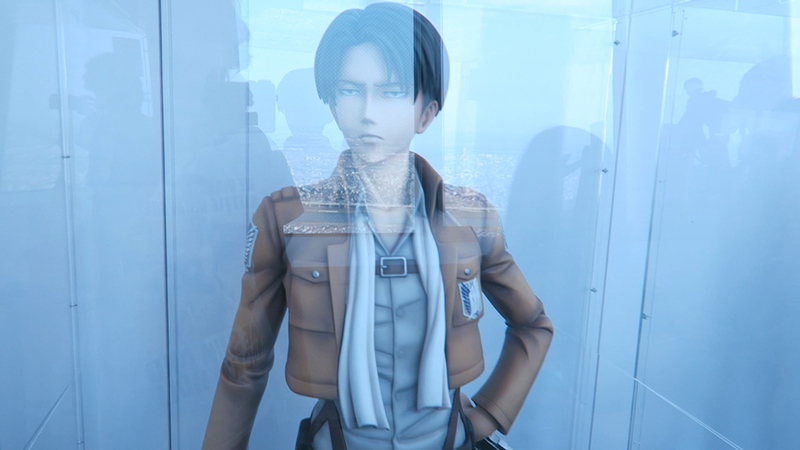 The final stretch of this event was yet another "Japan-only" was of selling a successful product; none other than the "Attack on Titan Cafe"! 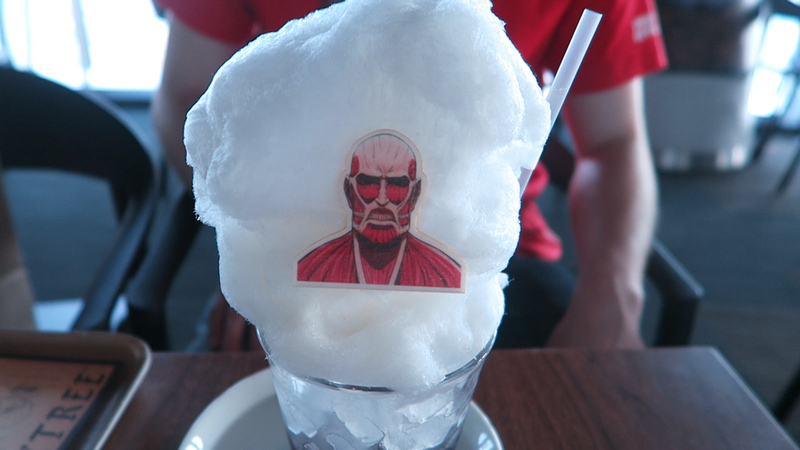 Situated on the lower floor of Tokyo Skytree, the cafe serves numerous types of Attack on Titan themed foods and drinks, and almost always exclusively gives you a free Attack on Titan character coaster (pictured below) which can be thought of as a free piece of merchandise you can take home and show off to your next guest. 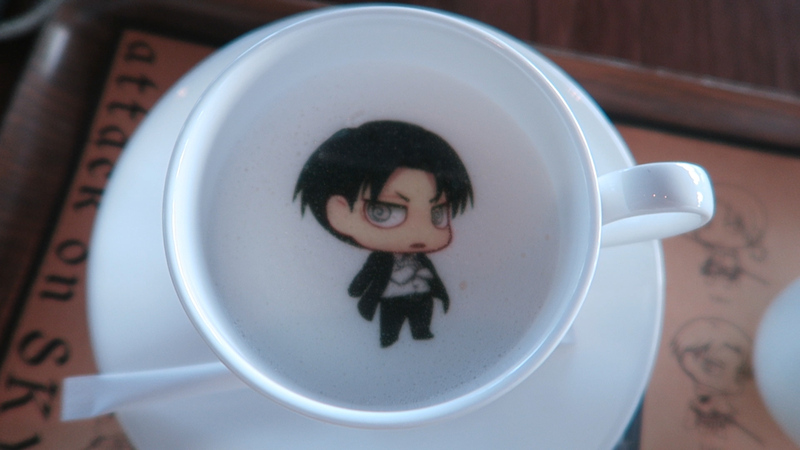 Unfortunately when we got to the cafe, almost everything they had was sold out except for two; one being a cotton candy topped colossal titan soda, and the other being a cup of royal milk tea with a printed picture of Levi floating on top of the bubbles. Both went for a relatively cheap price and was definitely a nice way to end the exhibit, sipping a nice cup of milk tea and looking out at the fantastic view of the city from the top of Tokyo Skytree! If you'd like to check out the video blog I took of the whole experience, then check out the video below! 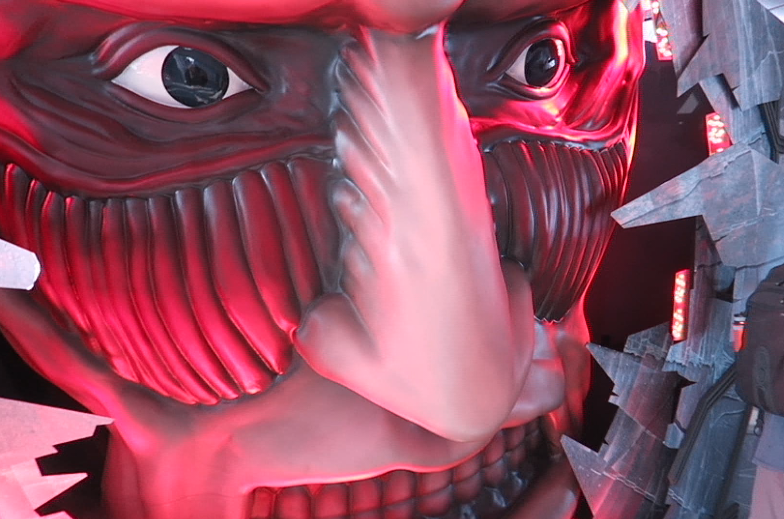 Attack on Skytree – a great spot for Attack on Titan fans!